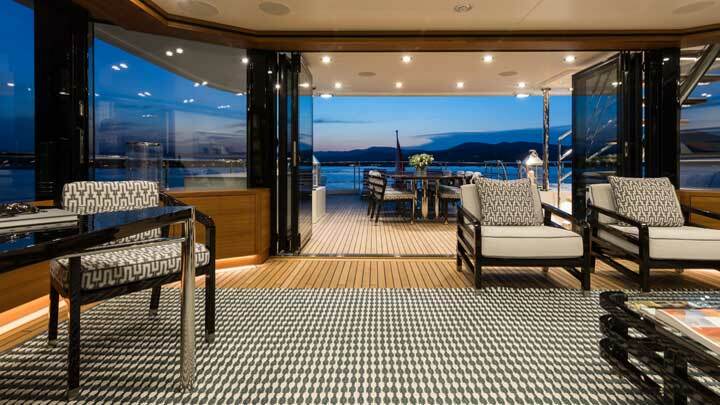 Moonen has built a reputation for long-range, “small” megayachts that can and do undertake true distant journeys. Furthermore, it’s staked its reputation on steel-hulled motoryachts in sizes where most builders only offer fiberglass. Flouting market tradition continues to work well for Moonen, as proven by Brigadoon. 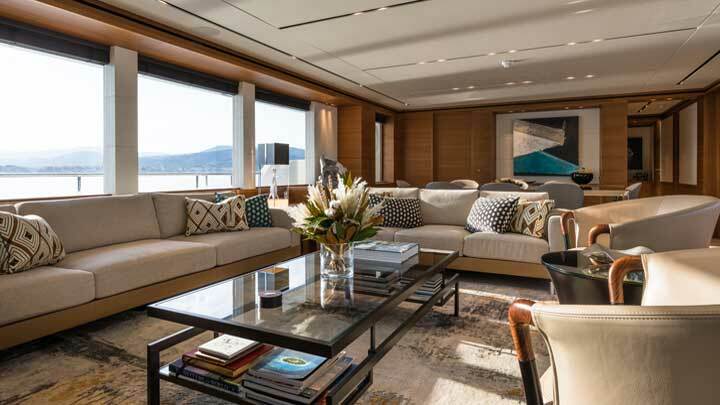 Belonging to owners who share the shipyard’s priorities, Brigadoon is 118 feet (36 meters) of chic comfort and seagoing style. Despite her LOA, the megayacht has a healthy volume, 350 tons. It results in Brigadoon feeling more ample. In fact, she handily hosted 70 for a private party during the Monaco Yacht Show last September. Also, despite being far along in construction when her owners acquired her, they still tailored her to their needs. For instance, the original interior, by Nauta Design, called for subdued tones and a family-friendly focus. Teak paneling already lined the walls from the upper-deck lounge to the four guest cabins below decks when the owners stepped in last spring. They, in turn, brought in Studio Indigo to collaborate with Nauta Design. Brigadoon retains a laid-back air, though naturally with more personalized pops of visual interest. From the main-deck master suite, where the plaid headboard elicits a smile from visitors, to hand-picked art, Brigadoon reflects their personality. Simultaneously, she shows off a feature for which Moonen has become famous. 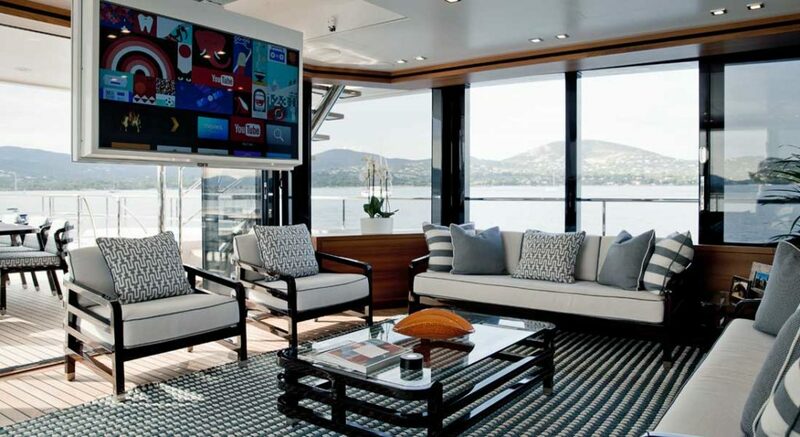 Back before the megayacht industry strove to bring the outdoors inside via large windows, Moonen introduced a true indoor-outdoor lounge. On the upper deck (at top and below), it has full-height, glass doors aft that fold away. Furthermore, the teak sole replicates the look and feel out on deck. Brigadoon’s owners thematically unite it with the alfresco dining area through the furnishings. It probably won’t surprise you to learn they spend abundant time here, either. Even in retaining the general arrangement, the owners of Brigadoon did make a few notable structural changes. For instance, they didn’t want the hot tub already installed on the sundeck. Furthermore, they requested a hardtop for more permanent shade. Previously, Moonen had planned for an extendable bimini. The shipyard made the changes in time to launch Brigadoon last June. 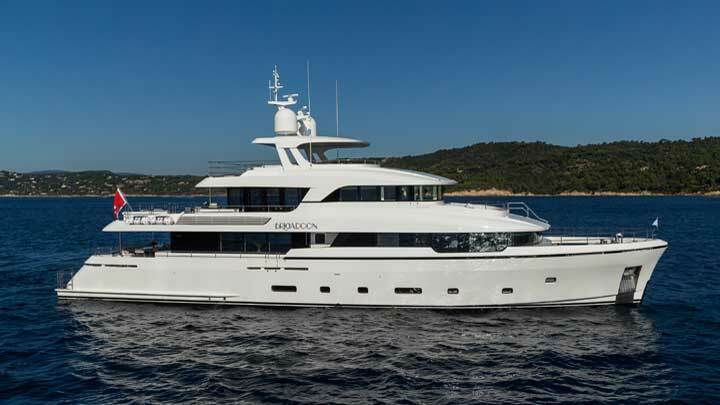 Since taking delivery in July, the owners of Brigadoon have enjoyed European cruising. In fact, they spent time in Croatia just after delivery. In addition, they’re currently enjoying the mild winter conditions in Spain. When the owners feel like venturing far, they can take advantage of a 4,000-nautical-mile cruising range under Caterpillar power. Top speed is 17 knots. In the meantime, Moonen has a sistership in build on spec. The shipyard was so pleased with the working relationship with Studio Indigo that it extended the invitation to reimagine a second hull. Buyers are, of course, still able to tailor the look. Delivery can take place next spring.